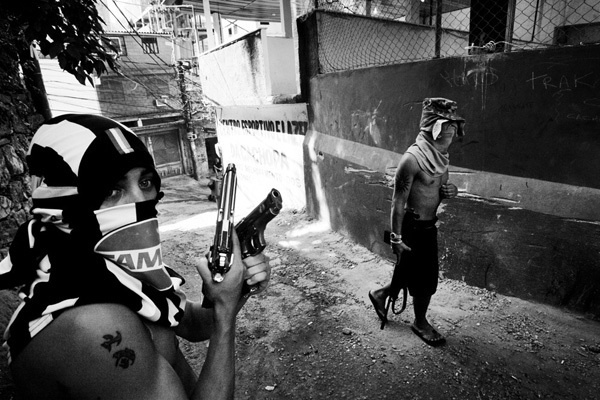 Two members of the gang, Amigos dos Amigos, patrol the streets of Rocinha. Two rights in Rocinha that not everybody has access to are the rights of safety and education, a similarity that connects them with places all around the world that don't have proper security and the opportunities to get a better education, but differentiates them greatly between rich communities right beside them. According to the United Nations' Universal Declaration of Human Rights article three, "Everybody has the right to life, liberty, and the security of person." In Rocinha, this article isn't necessarily met for some of its residents because of the violence that arises between drug gangs and the police. The two drug gangs competing for control of Rocinha are Comando Vermelho (Red Command), who control the higher region of the the favela, and Amigos dos Amigos (Friends of Friends), who control the lower region. In 2004, these two gangs engaged in a large gun fight that left fifteen residents dead, including the boss of Comando Vermelho, who was shot by the police when they intervened. The police in Rio are trying to address the violence between drug gangs in favelas. In 2011, Rocinha became the twenty-eighth neighborhood in Rio that was occupied by the elite pacifying police force (UPP). This was the biggest force in Rio, consisting of 700 officers. However, like other neighborhoods, Rocinha still remains insecure, even though it has been occupied by the UPP. Within a year of the operation, thirteen residents were murdered, and Rocinha was even more unstable due to the arrest of the local boss of Amigos dos Amigos, Antonio Bomfin Lopez. Conflicts arose when Comando Vermelho tried to take over the territory controlled by Antonio Lopez and the members of Amigos dos Amigos fought to regain their territory. The top graph shows the number of violent crimes per thousand people in Rio de Janeiro starting from 2008, the year when the first UPPs were installed. 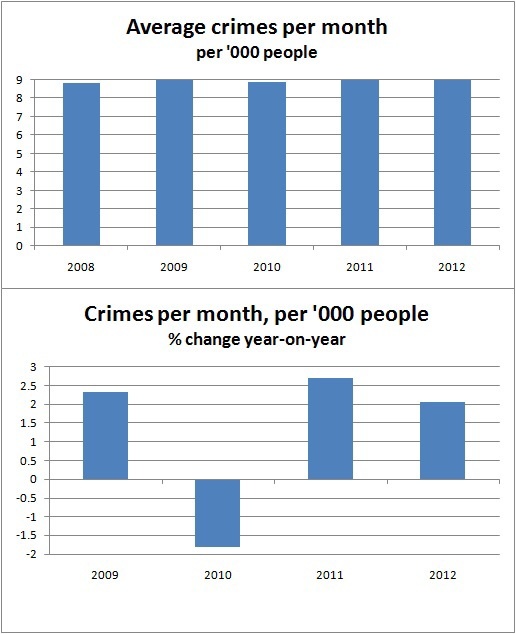 Although it may not look like crime rates have changed at all, the bottom graph shows how the crime rates in Rio have actually been increasing, despite the installment of the UPP. Another right not met in Rocinha is the right to education and the right to an adequate job. Even though Rocinha has over 100,000 residents, there are only two public schools in Rocinha, and many families aren't able to afford a private school education. Most children do get a primary education, but they don't learn enough to pass the Vestibular, a difficult entry exam required to get into college. Also, many families find it more valuable for their kid to work than to finish their secondary education, so seeing twelve year old kids selling goods on the street is a common sight in Rocinha. This is unfortunate because in Brazil, people with a tertiary education receive 150% more of a salary than those who don't. Also, many kids turn to dealing drugs as an easy way to make money. Unemployment arises in favelas like Rocinha, not only because of a lack of education, but because of discriminations against people of a certain group. This contradicts article 23 of the Universal Declaration of Human Rights which says, "Everyone, without discrimination, has the right to equal pay for equal work." Many employers discriminate people of a certain race, especially if their skin is a darker color, which affects the majority of Rocinha's residents. However, a discrimination as big as that of race is the discrimination against favela residents because they are viewed as criminals. The government is trying to prevent discriminations against social class in race in terms of education. In 2012, they passed the Law of Social Quotas, which requires public universities to reserve fifty percent of their spots for low income families and helps reduce discriminations against race.